Was haben der Wasser-Trippelpunkt und die Titanic gemeinsam? Und was der Grand Canyon und Schneeflocken? Eiswasser! Es ist durchaus bekannt, dass Wasser für die Existenz der Erde und uns Menschen unerlässlich ist. Wasser beeinflusst uns, es ist lebensnotwendig, Wasser bietet Erholung und ist Gefahr zugleich. Wasser grub den Grand Canyon, es kann Berge zerbröseln und Schiffe aus Stahl rosten lassen. Unser gesamtes Leben dreht sich ums Wasser. „Es ist erstaunlich, wie wenig wir über das alles wissen,“ schreibt John Tavener. Amüsant präsentiert John Tavener, eine international anerkannte Koryphäe der hochpräzisen Temperaturmessung, einen Aufsatz über den Wasser-Trippelpunkt. Er spannt einen Bogen von der Bedeutung des Wassers, der Entdeckung des Wasser-Trippelpunktes als Temperaturstandard bis hin zur Weiterentwicklung des Wasser-Trippelpunktes. Er erläutert detailliert den Aufbau und die Funktionsweise des Wasser-Trippelpunktes. Lesen Sie im Folgenden die englische Originalversion einer wissenschaftlichen Abhandlung zum Thema Wasser-Trippelpunkt, gespickt mit einer feinen Priese englischen Humors. Water comprises Hydrogen and Oxygen – just imagine the volume of these two gases needed to create all the water on the earth. It amazes me that air, a mixture of 80% Nitrogen and 20% Oxygen can support a kilometre high cloud of millions of kilograms of water vapour, transfer it halfway around the world, and dump it back on earth. How hail the size of tennis balls can come from the same water vapour that creates the myriad of fluffy snowflakes. Water, in the form of ice that coats the North and South Poles of the world, in whose depths are preserved, frozen in time, the history of the earth’s climate. Water that carved the Grand Canyon and crumbles the mountains into sandstone and shale. Glaciers that move large masses of stone hundreds of miles. Our whole lives revolve around water, our habits, pursuits and recreation are dictated by water. Our deaths caused by lack of it. It is surprising then, how little we know about it. “At atmospheric pressure water has a specific gravity of 1.0 at 4°C”. This statement contains the most important fact about water, a secret that created life. The fact is that water is densest at +4°C. Densest water is heaviest and so resides at the bottom. would have frozen from the bottom up and life as we know it would not have evolved. If ever there was a scientific proof that God exists it is surely the inexplicable fact that water is densest at +4°C. Ice is some 10% less dense than water and so floats with 90% of its bulk under-water as the Titanic found to its cost. Water supercools, this means it stays liquid below 0°C its solidus temperature. The first description of supercooled water is interesting, it illustrates how often great discoveries happen accidently. Daniel Gabriel Fahrenheit, born 1686 in Danzig writes in 1724 that he slipped on the stairs while carrying a flask of supercooled water and found that it suddenly became “full of flakes of ice”. The temperature of pure ice and water is actually +0.0025°C and not 0°C as most of us suppose. To get 0°C we should write; “air saturated pure ice and water”. A simple mistake I guess we all make. Water rapidly absorbs air when in contact with it and so air saturation is the normal state of ice and water mixture. The ice/water temperature is pressure dependant, and to remove that dependence we can contain the mixture and create a vacuum – or try to. As the vacuum increases the water begins to boil or vaporise and this limits the vacuum we can achieve. The mixture of ice/water and water vapour in equilibrium is the water triple point and its temperature 0.01°C by definition, and without uncertainties. Water/ice was historically recognised as a key temperature in the development of international temperature measurement standards, in fact the triple point of water with absolute zero are the two points that define the Kelvin Thermodynamic Temperature Scale (KTTS). Arbitrarily divided into 273.16 we obtain the degree Celsius or Kelvin, an interval of temperature used throughout the world. We cannot achieve absolute zero but we can realise the triple point of water, so in practical terms there is only one realisable temperature to define the scale of temperature internationally. Naturally a lot of attention has been paid to it since the uncertainty of its realisation dictates the uncertainty of all measured temperatures. I will also focus now on this artefact and tell its story through the contribution of one man. During the early 1940’s H. F. Stimson of the National Bureau of Standards (NBS) in America recommended the water triple point as the most accurate temperature close to 0°C. Prior to this date the ice point had been the accepted fixed point close to 0°C. 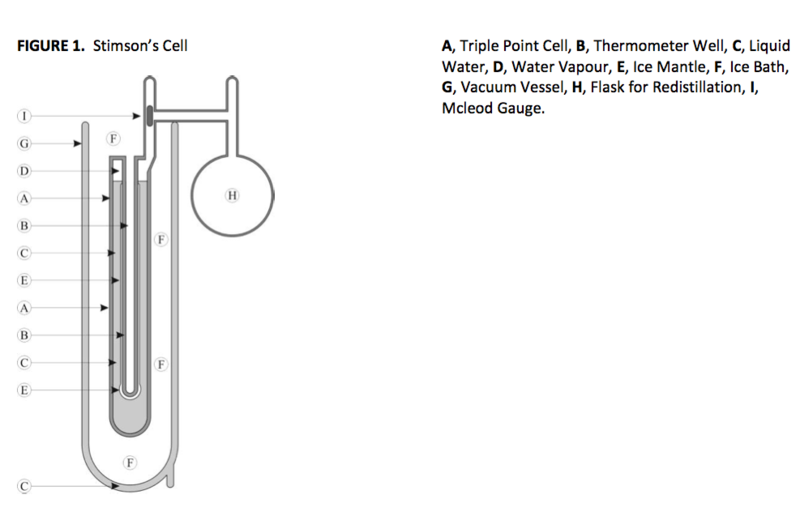 Stimson’s proposal reduced the uncertainty from ±0.001°C to ±0.0001°C, a tenfold improvement but at the cost of a more complicated piece of apparatus, the triple point cell. In an article  he described a suitable water triple point cell. It had an attached flask which he could transfer the cell’s contents and slowly redistill it back into the cell, leaving behind as a residue any impurities in the water. He did this because he was unsure how rapidly the borosilicate glass from which his cells were made would dissolve into the water, see figure 1. To prepare the internal surface of the cell, Stimson first etched the glass surface with a strong alkali, followed by 5% hydrofluoric acid which leached ions such as sodium and boron, leaving a surface of predominantly silica. The cell was then steamed for hours, if not days to remove any residue chemicals and further leach the surface of glass, lastly water from his still was introduced under its own vapour pressure and the cell was sealed. Stimson discovered that the glass did not dissolve into the water of his cells within his target of ±0.0001°C and so the flask was removed and the branch tube that joined the cell to the flask was bent through 90° and sealed. 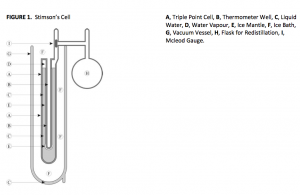 It acted as a hook to hook the cell onto the thermos of crushed ice used to maintain the triple point of the cell, and as a Mcloed gauge to assess the effect of trapped air. The drift downwards in a water triple point cell was too small to concern Stimson. However as researchers strove to get closer to the perfect cell this drift was measured. Dr. K. Hill of NRCC analysed the drift in a sample of over 20 cells of varying age and noted an average drift of -4μK p.a [2, 3, 4]. Any air trapped inside a water triple point cell increases the pressure compared to the vapour pressure of the water, this has the effect of lowering the triple point temperature. The air may be assessed subjectively by the sound the cell makes when shaken or objectively by compressing the volume of vapour within the cell (in a Mcleod gauge the volume of any bubble that forms when the vapour is compressed can be used to quantify the depression due to the trapped air [5, 6, 7]. Stimson’s cells were so good that NBS were producing them for outside industry and at some point in the 1950’s to avoid any conflict of interest the still was rebuilt in Jim Cross’s basement of his bungalow in Maryland, and the Jarrett Instrument Company was born (Jarrett is Jim’s wife’s maiden name). As well as supplying NBS, well over 2000 cells were supplied to organisations globally. To assure the cell quality Jim Cross occasionally sent cells to NBS who would compare them to their reference cells – cells selected as having the highest temperature (because trapped air, and impurities both lower the water triple point temperature). Jim claimed +0 to -40μK of the “ideal” water triple point temperature for his cells [8, 9]. The ideal triple point (the equilibrium temperature of a pure substance in liquid, solid and gaseous form) has only 1 degree of freedom and hence only 1 temperature. Water is not an ideal substance being a variable mixture of H, 2H, 3H, 16O, 17O and 18O. Most water has a triple point variation within Stimson’s ±0.0001°C. But again as measurements improved it was realised that the Isotopic Composition needed to be considered. By the 1968 temperature scale the water had been specified to be “of the isotopic composition of ocean water”. Ocean water is very consistent in its isotopic composition varying only by the equivalent of ±3μK. Standard Mean Ocean Water (SMOW) is defined exactly in terms of its isotopic composition to this standard. 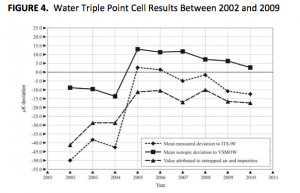 Eventually in 2005 CIPM adopted SMOW as its reference analysis for water triple point cells. (The original sample of SMOW was replaced by V- SMOW and most recently by V-SMOW.2). The local water used by Stimson was approximately 40μK low compared to SMOW and so well within his ±0.0001°C, furthermore his still spilled the lightest water as steam and so the cell water was close to SMOW, hence the 0 to -40μK claimed by Jim Cross. Because of this the isotopic issue was not thought to be of great importance. The problem of isotopic variance was investigated by John Nicholas of New Zealand and together with Dr. R. White they published a series of papers that showed variations of -100μK to +10μK around the world. The result is that the best water triple point cells now come with an isotopic analysis of the water in the cell that can be used as an offset from SMOW [10, 11, 12]. In 1982 a very detailed analysis of NBS stock of water triple point cells was published  and showed general agreement with Jim’s claims. Jarrett cells took part and were often used as the reference cell in many intercomparisons, these were summarised in 1997 by Henry Sostmann . By 1996 Jim Cross was too ill to attend the still and so it was transferred to the custodianship of Phil Metz who continued to produce cells until 2000 when the still became un-repairable. Stimson’s still had produced cells for over 50 years. It comprised 2 litre flasks which were heated by gas fired Bunsen burners. In 2000 these were replaced by 5 litre flasks, heated by electricity. In all other respects the new still replicated Stimson’s original. Since 2000 this still has produced well over 1000 cells and 10% of these have been compared to reference cells and have had water samples analysed for isotopic composition under UKAS supervision [4, 13]. Manufactured cells are compared to one or more reference cells and since all normal cells contain some impurities, the original Stimson cell was recreated on basis that the impurities can be distilled out of the cell as described by Stimson in 1945 . A Mcleod gauge was added to Stimson’s design to enable measurement of any residual air, and the reference cells have an isotopic analysis, accurate to an equivalent of ±2μK. During this period the original target of 0 to -40μK to SMOW was maintained. 18O V-SMOW %o, -28 ￼ 2H V-SMOW %o . 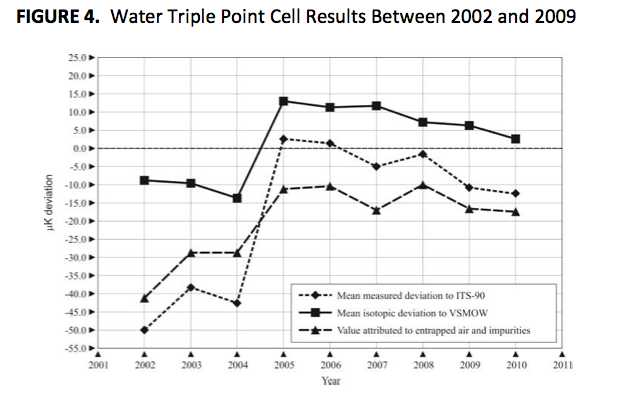 The results of all cells tested between 2001 and mid- 2005 are presented in Figure 2. In 2005 two important events occurred. Firstly BIPM published an Intercomparison of Water Triple Point Cells from 22 National Laboratories (CCT-K7). Secondly BIPM adopted SMOW as its reference isotopic composition [14, 15]. In response to these changes Stimson’s second still was adjusted to spill more water in the form of steam and a new target of 0 ±20μK to SMOW was set. Cells made and tested after this change in 2005 are shown in Figure 3. Figure 3 shows the difference between isotopic analysis of the cells and the comparison to the Stimson reference cells was 11.3 ±15μK S.D. representing impurities and air trapped in the cells. Further confirmation came in 2005 from PTB, the German National Laboratory who analysed three cells using inductively coupled plasma mass spectrometry and measured less than 10μK equivalent impurities. A summary (Figure 4) charts the results from 2002 to 2009. Clearly shown is the step changes made in 2005 to the still’s target temperature. It also shows the consistent performance of Stimson’s second still. Table 1 shows the results of all cells measured and their standard deviation. Table 2 is a summary prior to the stills change of target temperature and subsequent results. With a target of 0 to -40μK the still produced cells with a mean value of -23 ±15μK to SMOW between 2000 and 2005. With a target of 0 ±20μK the still produced cells with a mean value of -1 ±14μK to SMOW from 2005 to 2009. 0 to -40μK of SMOW. This was well within the ±0.1mK uncertainty expected by Stimson in 1945. 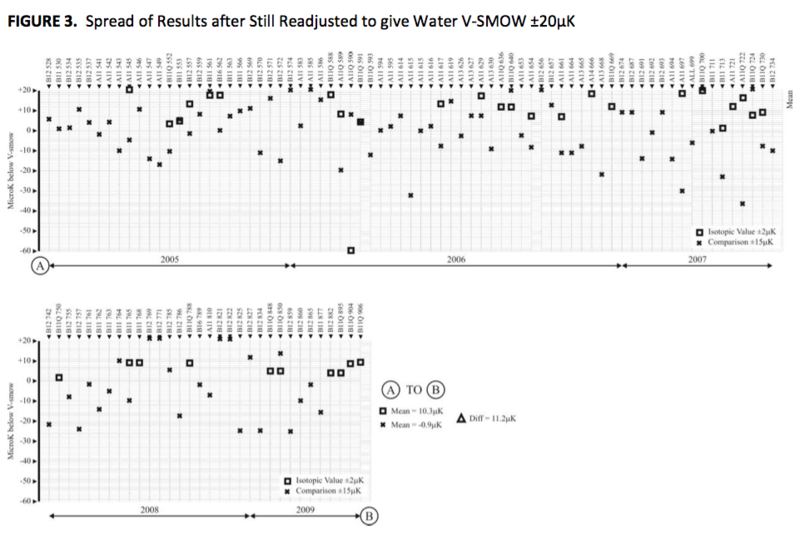 The BIPM report of 2005 (CCT-K7) and the recommendation that the SMOW definition be used within ITS-90 stimulated changes to Stimson’s second still to increase the water’s temperature by 20μK whilst maintaining the spread of ±20μK. The best intercomparison uncertainties are around ±15μK  and so a spread of ±20μK seems appropriate for current use. However the second still is capable of producing cells closer to SMOW by reducing the output to very low levels. In 2010 a Stimson cell was produced targeted to be close to V- SMOW.2. 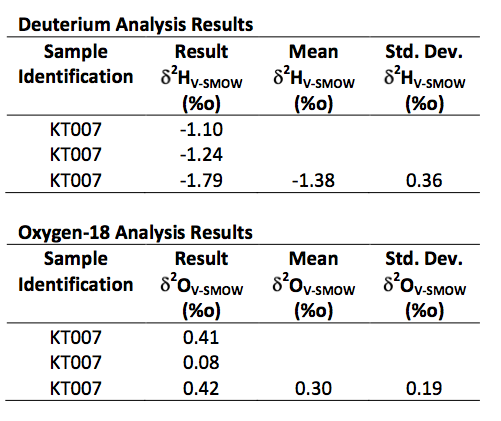 The water sample from the cell was analysed for isotopic composition and found to be within 1μK ±2μK of V-SMOW.2, see Appendix 1. 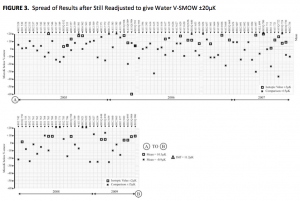 100 cells from a total of over 1000 cells made since 2000 have been analysed, the results show that Stimson’s still continues to produce water for triple point cells that conform very closely to V-SMOW.2. Typically ±20μK S.D. 3μK, exceptionally ±1μK S.D. 2μK. Stimson’s cell complete with its attached flask remains the best reference cell even 65 years after it was described by him in 1945. This is because of its unique ability to transfer the small traces of impurities in the cell to the flask where they take no further part in the creation of the triple point. The temperature of the triple point being then dependent only on the isotopic composition of the cell’s water. We should not take water for granted. It provides the Fulcrum of the International Temperature Scale and defines the Kelvin. It can sink unsinkable ships like the Titanic! 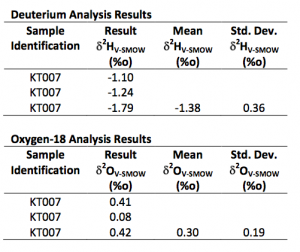 Extracts from Isotopic Analysis certificate for Stimson cell Serial No. KT007. We are indebted to all those customers who asked for UKAS certificates to accompany their Water Triple Point Cells which enabled us to gather the data for this article. In 2009 CIPM issued CIPM-2009-24 “Traceability in CIPM MRA”. Since when the requests for UKAS certification has stopped and in consequence so has our ability to continue this detailed research. The Authors wish to acknowledge the contributions of J. Wilkinson, Dr. G. Bonnier and Dr. R. White in the preparation of this paper. 1. H. F. Stimson, The Measurement of Some Thermal Properties of Water, Journal of Washington Academy of Science Vol.35, No.7. 4. J. P. Tavener & N. Davies, Quartz Vs Borosilicate WTP Cells, Tempmeko 2010. 5. Isotech Journal of Thermometry, Vol 7.2, 1997. 6. Temperature, Vol. 5 P292, 1982. 7. Dr. R. White, Measuring the Residual Air Pressure in Triple Point Cells, MST 15(2004) N15 N16. 9. H. E. Sostmann, Evaluations of Water Triple Point Cell, A Summary Report of Recent International Intercomparisons. Cal Lab July-August 1997. 10. S. V. Gupta, Unified Method of Expressing Temperature Dependence of Density of Water. MMGT-2001, NPL, New Delhi, India. 11. Dr. White, W. T. Tew, Evaluation of the Depression Constants for D and 18O Isotopes for the TriplePointofWater. CCT/03-21. 12. J. V. Nicholas, T. D. Dransfield, B. W. Mangum, G. F. Strouse, R. L. Rusby, J. Gray, Effects of Heavy Hydrogen and Oxygen on the Triple Point Temperature of Water, Tempmeko 1999, P 95-99. 14. Clarification of the Definition of the Kelvin, Unit of Thermodynamic Temperature, CCT/05-07a. 15. M. Stock, S. Solve, Key Comparison of Water Triple Point Cells, BIPM CCT-K7, 31 January 05 Rev. 1.